In 2011 I returned from my first One Young World (OYW) Summit driven to find a project that would show that sustainability is not a zero-sum game. Or in the words of Bob Geldof I wanted to “get on with it” for sustainability. 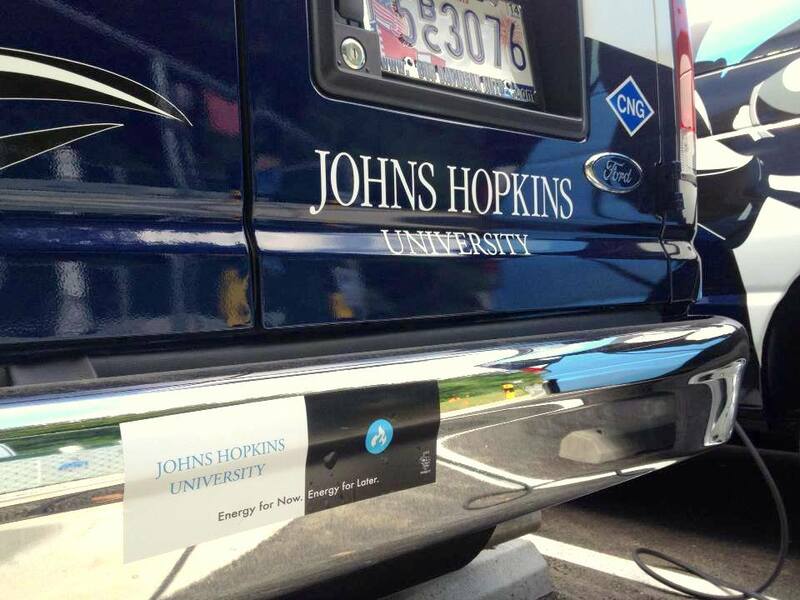 Working with the first-ever Sustainability Committee of the SGA at Johns Hopkins’ Homewood campus, I identified the Blue Jay Shuttle service as an ideal target project. The shuttle fleet comprises ten Ford E-350s that transport students at night around campus on fixed routes. Over six months of research, I calculated a transition from gasoline to natural gas would save more than 750,000lbs of CO2. Also, the transition would pay for itself in less than seven years and have a ten-year internal return rate of 16.1%. However, eventually he became intrigued but insisted the reliability and capability of his fleet not be compromised. Therefore, I worked with the Maryland Energy Administration to obtain grants and the Ford Motor Company to ensure a transition to natural gas would maintain full functionality of the vehicles. My work led to a pitch in December 2011 to the deans of finance, who remained doubtful and all but dismissed my proposal. Temporarily disillusioned, I redoubled my efforts, took my proposal to more people and pitched the project at every chance. I mobilized the SGA to increase student involvement and worked with all of the key players to refine and strengthen the project. But before I made the pitch again, I wanted a little more support. I had heard of a sustainability video contest put on by the White House Council for Environmental Quality (CEQ). A couple of friends and I made a three-minute short video on the project and how it fits into the broader concept of sustainability. To our surprise, the video won and we were invited to the White House to meet with officials from the CEQ. My project was getting the attention it deserved. The tenacity and persistence proved to be invaluable, as I eventually landed the opportunity to make a pitch to JHU President Ron Daniels. He agreed to nothing at the time, but behind the scenes he followed up with the main stakeholders and learned that I had left no stone unturned. A month later, President Daniels announced full financial backing for the project. Two fulfilling years later the project is complete, the vehicles are running and the school is looking to expand the fleet. Fleet managers at universities are in a unique position to affect positive change in transportation. They control both the vehicles and fueling centers whereby solving the ‘chicken and egg’ problem of transportation development. With 4,000 colleges serving 20 million students, the progressive market is already organized to create the foundation for a geographically diverse fueling network. This is why we have founded the University and College Partnership for Efficient Transportation (UCPET) to advocate for a change in powertrains on campuses. Whether it be natural gas, propane or electric, creating a diverse fueling network will be crucial to fighting climate change. After attending my third OYW conference in Johannesburg in 2013, I am more inspired to continue the push for sustainability in all aspects of life. I believe sustainability is an activity in which everyone can take part and every party wins; without it, everyone loses.